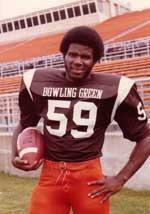 A four-year letterwinner at Bowling Green, Andre Young proved valuable to the Falcon teams of the early 1980's with the versatility to play numerous positions. After sitting out the 1978 season with a knee injury, was a linebacker in 1979 and 1980. The following year, he moved to defensive tackle as a junior and was among the MAC leaders in tackles for loss with 15. Young was named to the All-MAC First Team as a senior, leading BG to a 7-2 conference mark and a berth in the 1982 California Bowl, their first bowl appearance in 21 years. He led the MAC with 26 tackles for losses totalling 127 yards that year, and earned MAC Defensive Player of the Week honors for BG's 7-3 win over Western Michigan. In that game, Young had 13 tackles, including two fourth quarter sacks. He was also selected first team Kodak Division I-AA All-America in 1982 (MAC was I-AA in 1982) as well as team Most Valuable Player. He was drafted in the 12th round by the Cincinnati Bengals of the NFL, and also played in the USFL (Denver), CFL (Calgary) and with Green Bay in the NFL.